Colour expert Pantone has chosen a peachy orange shade named Living Coral, or Pantone 16- 1546, as its colour of the year for 2019. Announced on 6 December 2018, the Living Coral colour is described by Pantone as an “animating and life-affirming coral hue with a golden undertone that energises and enlivens with a softer edge”. “Sociable and spirited, the engaging nature of Pantone 16-1546 Living Coral welcomes and encourages lighthearted activity,” said the company. Following on from 2018’s colour of Ultra Violet, dubbed by the company as a “dramatically provocative and thoughtful purple shade”, this year’s vibrant shade of golden orange is meant to reflect the “innate need for optimism and joyful pursuits” as a response to social media and digital technology. “In reaction to the onslaught of digital technology and social media increasingly embedding into daily life, we are seeking authentic and immersive experiences that enable connection and intimacy,” explained Pantone. The colour is also said to reference the nourishing impact of coral on sea life, as well as the “devastating” effect of today’s society on the environment. Pantone announces a colour of the year every December, based on trend-forecasting research from the Pantone Colour Institute. The colour is chosen based on “what is taking place in our global culture at a moment in time”. According to the brand, Living Coral is already being spotted on catwalks in fashion shows, as well as on social media. “Colour is an equalising lens through which we experience our natural and digital realities and this is particularly true for Living Coral,” said Leatrice Eiseman, executive director of the Pantone Colour Institute. “With consumers craving human interaction and social connection, the humanising and heartening qualities displayed by the convivial Pantone Living Coral hit a responsive chord,” she continued. The Pantone Colour Institute has been choosing a colour of the year since 1999. Last year, a vibrant purple shade was chosen, and in 2017, a zesty shade of green called Greenery. In 2016, Pantone picked two soft colours – a baby blue and dusty pink. The colours are often bold in tone. Other recent examples include the purply pink Radiant Orchid announced for 2014, and the bright orange Tangerine Tango in 2012. Located near the beautiful beach of Houhai village on the South China sea this trendy surf hotel was refurbished and redesigned from a fishermen’s family home into an intriguing and youthful surfing-theme resort hotel. The designers from Modulo architects carried out the project of SIXX Hotel transforming the old fisherman’s building into an absolutely new concept. additions and the elegance of trendy tile compositions and ash wood structures entwine into one light and clear lined decor composition. Playful design elements like the colorful surfing boards and the pink mobile furniture add a fun and youthful decor touch to the overall light and casual design composition. Photography by Haibo Wang. 3D-printed chairs designed by Zaha Hadid Architects, Ross Lovegrove and Daniel Widrig make up the first collection of new Spanish brand Nagami. Nagami made its official debut at last year’s Milan design week with four 3D-printed chairs. The collection’s name, Brave New World, is based on the 1930s dystopian novel of the same title by Aldous Huxley. It includes two chairs, Bow and Rise, designed by Zaha Hadid Architects, a stool by British designer Ross Lovegrove called Robotica TM, and the Peeler chair by London architect and designer Daniel Widrig. “We design products that until now were just waiting for the right technology to come to life: not only objects that you can hold, but also that you can feel and experience as part of your environment,” said Nagami founders Manuel Jimenez García, Miki Jimenez García and Ignacio Viguera Ochoa. polylactic acid plastic – a biodegradable, non-toxic material made from renewable resources like cornstarch, making it both lightweight and sturdy. Featuring a curved seat supported by a large, singular base, both pieces were 3D-printed with a pellet-extruder, which uses raw plastic particles rather than filaments. While the Bow chair boasts a spectrum of blacks and purples, the Rise chair is formed of a blue base that morphs upwards to white, finished with gold detailing at the top of the seat. These colour gradients and the unusual patterns they form are intended to redefine the traditional spatial relationship between furniture and its setting, according to the brand. Ross Lovegrove combined botany and robotics for his Robotica TM stool, which draws parallels between the “natural programming” found in nature and the artificial manufacturing that occurs in the field of robotics. The stool was built using a continuous rotational process that causes each layer to fuse together while being stacked on top of each other. This “rhythmic and inverted” form would be difficult to produce by conventional means, says Lovegrove. With a seat made from heat-proof silicone inserts, the stool can be easily adapted to serve as a table for eating, said the designer. It can also function as a plinth for a TV, or simply as a stand-alone decorative feature in the home. It took just a few hours for an industrial robot to 3D print Widrig’s Peeler chair, which is composed of three pieces of seven millimetre-thick shells of PLA plastic. Described by the designer as “skin-like”, these three undulating surfaces were assembled to look as if they are “peeling off of an invisible joint body.” Widrig wanted his product to consume as little machine time and as little material waste as possible, and to “overcome the limits of additive manufacturing.” “The chair has been designed to satisfy both the ergonomic constraints of the human body, as well as the ergonomics of the robotic arm that prints it,” said Widrig. In the era of the collaborative economy, flexibility and nomadism, coworking is emerging as one of the responses to these changing needs. Coworking entails renting shared office space, either on a one-off or on a subscription basis. The idea is to share an office, and in particular, to use this office only when necessary. What also appeals to coworkers, is working in a collaborative environment – a concept entirely in keeping with the times. The trend largely concerns freelancers and startuppers – in addition to gaining flexibility in workplace costs, these workers seek to immerse themselves in an innovative and emulative atmosphere. They are also looking to network, boost creativity and even grow their business. These “officeless” workers are progressively being known as “FreeWorkers”. 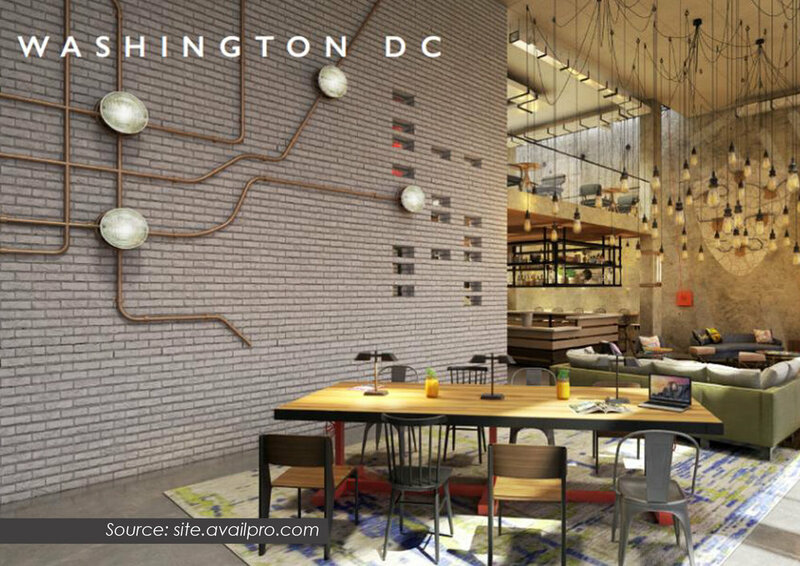 In response to this trend, coworking spaces are springing up almost everywhere in large cities, and the phenomenon hasn’t spared the hospitality sector either. 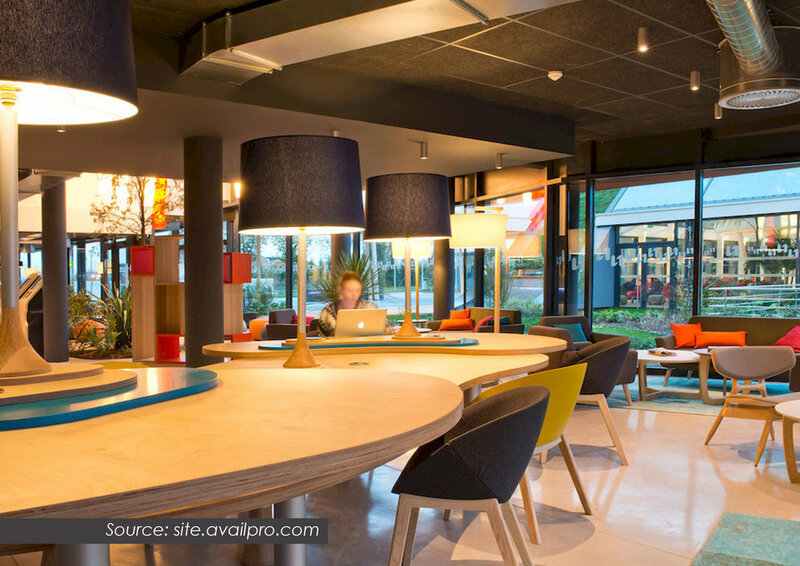 Coworking in hotels responds to a new need and a new way of satisfying guests, but it actually goes further than that – hotels may also regard coworking as a means of making money from underexploited or unused spaces. The cost of investment is not particularly substantial, since hotels are generally already equipped with the necessary elements – Wi-Fi, chairs, tables, etc. In addition, staff are already on-site to supervise the service. Hotels can thus optimise their square meterage, and in some properties it is the lobby that plays this role. For others, the breakfast area is transformed into a work space once the breakfast shift and cleaning are over. The term, “day-use” takes on its full meaning here, as by offering coworking spaces, hotels can take advantage of areas that are underused at certain times of the day. Yet it is more than this. Coworking is also a way for hotels to get their property talked about, to diversify their customer-base and to make the most of the wordof-mouth induced by the new service. Coworking also attracts new customers for the bar and restaurant, and is completely in phase with the current wave of new hotels open to their environment and local residents. Coworking is a way of creating a bit of life in a hotel, of livening up areas that often remain sad and empty. Who wants to sit down for a drink in an empty bar? There is truth in the statement that the busier the bar or restaurant, the more it attracts customers. 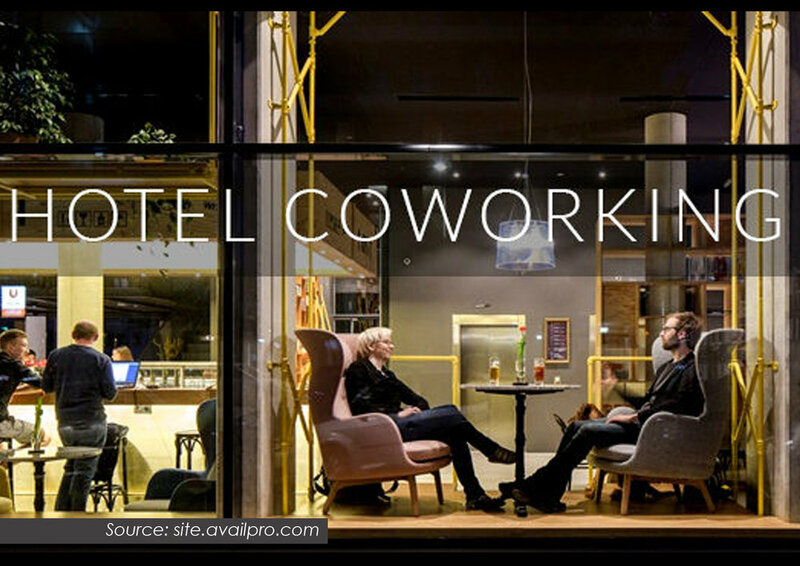 Coworking areas in hotels are found in locations conducive to such – close to stations, airports or business zones, for example. While waiting for a train, between two meetings, travellers can now maximise their time by working in a functional space, thus getting the most out of their business trips. With its very concept, this hotel goes even further, by offering a range of office spaces, including the lobby, patio or more traditional meeting rooms. Indeed, they’ve thought of everything – if clients require more privacy, they can use the small alcoves, specially created for this purpose. and Novotel hotels. MOB Hotel in Saint-Ouen offers a dedicated coworking space, baptised the “Kolkhozita”, reserved for certain professionals. Oceania, too, is active, with its Nomad brand that offers a large functional space adapted to the various needs of its guests, particularly to working. Moxy offers guests a vast multi-use space, and Society M (Citizen M) provides work areas that foster collaboration and creativity. And these are just a few examples. Municipal officials have greenlit plans to build Tyram Lakes – an eco-friendly wellness resort in South Yorkshire, UK. Designed by British firm Baca Architects, the estimated £20m (US$25.4m, €22.3m) retreat, which will be situated on 65 acres of lakes in the Humberside Peatlands, will comprise 325 floating lodges and 104 guestrooms. Each lodge will have a rooftop garden fitted with solar panels as well as built-in filtration systems that will recycle lakewater. In addition to accommodating a 100-cover restaurant, a gym, and two swimming pools, the soon-to-be-constructed resort will also feature a spa with six treatment rooms. The project, which is being developed by real estate company Rothgen Management, has been in the pipeline since 2016. Initial planning permission for the development was granted in March 2017.